Anadolu Efes Spor Kulübü (English: Anadolu Efes Sports Club), formerly known as Efes Pilsen, is a Turkish professional basketball team that is based in Istanbul, Turkey. It is the most successful club in the history of the Turkish Super League (BSL), having won the league's championship 13 times. The home arena of Anadolu Efes S.K. is the Sinan Erdem Dome, in Istanbul, which has a seating capacity of 16,000 for basketball games. The club has its own practice facility in the district of Bahçelievler, which was built in 1982. The team competes in the Turkish Super League and the EuroLeague. The club is owned by the Efes Beverage Group. The club was established in 1976, as Efes Pilsen S.K., by taking over the Turkish second-division club Kadıköyspor, which had failed due to financial problems. Its initial sponsor was its former longtime namesake, Efes Pilsen, a subsidiary of the Anadolu Group. It won the 1978 Turkish second division national championship undefeated, earning promotion to the Turkish first division, where it has continuously competed ever since. In its first top-flight season (1978–79), Efes Pilsen S.K. won the Turkish national league title, immediately establishing itself as one of the country's top clubs. After finishing 2nd in the 1992–93 FIBA European Cup, Efes Pilsen S.K. won the 1995–96 FIBA Korać Cup, which marked the first-ever European-wide title won by a Turkish club, in any team sport. Efes Pilsen S.K. (later renamed Anadolu Efes S.K.) has also become a fixture in the European-wide top-tier level EuroLeague, making it to the competition's EuroLeague Final Four in 2000, and also to the FIBA SuproLeague's 2001 Final Four, and finishing 3rd on both occasions. In 2011, the club changed its name to Anadolu Efes S.K., after the TAPDK (Tobacco and Alcohol Market Regulatory Authority) in Turkey, prohibited the advertisement of tobacco and alcohol products in sports organizations. For many years, Efes has used the Abdi İpekçi Arena, with a seating capacity of 12,270, to host its home games. Currently, Efes uses the 16,000 seat Sinan Erdem Dome, to host its home games. For a listing of past rosters, see Anadolu Efes S.K. past rosters. In 2006, Efes Pilsen became the first Turkish basketball club to be invited to play with NBA teams. They competed against the Denver Nuggets in Denver, Colorado on October 11, and against the Golden State Warriors in Oakland, California on October 12. In 2007, Efes Pilsen hosted the Minnesota Timberwolves at the Abdi İpekçi Arena. ^ ANADOLU EFES ISTANBUL Arena: SINAN ERDEM DOME. 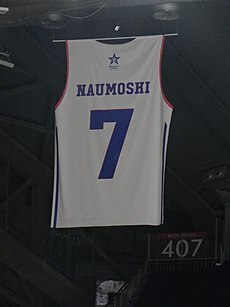 ^ "Anadolu Efes retired the jersey of Naumoski". Eurohoops.net. 9 February 2017. ^ Efes Pilsen: 81 - Minnesota Timberwolves: 84. Wikimedia Commons has media related to Anadolu Efes SK.